Oh, how I love me some Joyce Meyer! I can’t get enough of her no-nonsense and spirit-filled teaching. 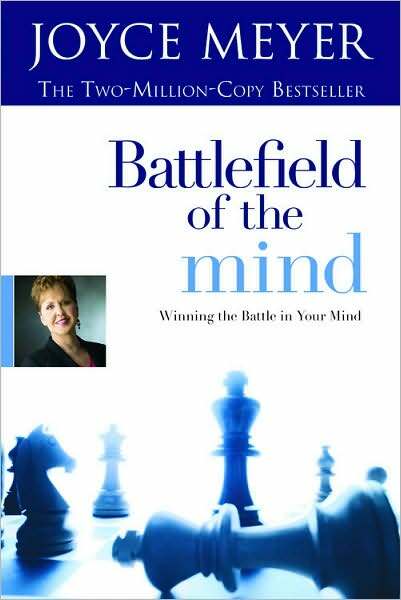 I highly recommend you read “Battlefield of the Mind” if you are looking to change your life or more importantly, change old thought patterns and mind-sets. It is invaluable to those of us who tend to get hung up in our own heads and who tend to over analyze everything. Before we go any further, let me just say that if you are not aren’t a Christian or you don’t believe in spiritual warfare, this book is not for you as Joyce’s method of changing thought patterns and fighting spiritual warfare is based on s Biblical principles and scripture. Now, don’t get me wrong, non-Christians can appreciate the “positive thinking” message, but honestly, that part is something you can get from numerous other self-help books. This book has the ability (through the power of the Holy Spirit) to change lives, but only if you are open to the possibilities. I don’t believe this book was designed so much to help the clinically depressed but rather the average Christian wanting to do more than “just survive” this life. I give this book 5 stars and would give it more if I could. Joyce teaches us how to discipline our minds through the use of scripture because she knows and understands most spiritual battles are fought in our minds or at least that is where they start. She actually gives specific verses to use in the midst of battle as well as share her own past experiences. I found this most helpful because real life application is where it counts. I can study all the Christian books I want, but if I don’t know how to apply the teaching in my everyday life, what is the point? Some critics claim that her experiences were not truly hardships (the story of the dress she gave away), but the fact that she used everyday problems made it all the more real for me. I can usually rise to the occasion with the big things, but I fail almost daily with the little things. God uses these little “insignificant” moments to teach us great life lessons. I found myself studying all her scripture references and the stories behind them. The story of the Israelites really stuck with me (I’ll get back to this in a moment). I also made a point to memorize the scriptures by writing them down and taping them to my bathroom mirror or desk at work. I was made aware of certain strongholds I didn’t even know I had and convicted to change those I did know I had but was choosing to ignore. Joyce’s openness regarding her own strongholds made it easier for me to examine my own. I was reminded that a lot of my problems not only come from my bad attitude or negative thinking, but from replaying and over analyzing things in my head. Joyce pointed out that blessings are not based on our actions, but rather God blesses us when we are ready for His blessings. This was so huge for me. I have been making major life changes regarding my walk with the Lord and I was so terrified that when I miss-stepped that I would be punished. However, the thing that stuck with me the most regarding this issue was that the Israelites took 40 years to get to the Promised Land when it should have only taken them 11 days! Why? Because they were not ready for the blessing of the Promised Land. Their constant complaining and disobedience was a clear sign that they were not ready for what God had for them. How true this is in our own lives! That alone was enough for me to call this one of the greatest books I have ever read. -It is best to do it God’s way first-obedience is a must. As Joyce so simply states, “ stinkin’ thoughts produce stinkin’ actions,” but the good news is we don’t have to be controlled by those thoughts or Satan any longer. Instead, we must recognize those thoughts as they come to our mind, capture them immediately, and see them for the lies they are and refuse to think upon them. I highly recommend this book for your bookshelf, coffee table, or night stand as it is sure to be a book to be read and reread as well as a quick reference for times of need. HERE’S SOME TRUTH FOR YOU ! … ARE YOU AWARE OF SOME OF JOYCE MEYER’S TEACHINGS? HER CLAIM OF JESUS’ ATONEMENT INSUFFICIENT THEREFORE HE HAD TO DESCENT INTO HELL TO FINISH HIS WORK? HER CLAIM THEA WE ARE LITTLE GOD’S? I MEAN C’MON PEOPLE … READ THE WORD OF GOD AND MISSY, STOP BEING MIS-LED SHE AND MANY LIKE HER ARE NOTHING MORE THEN MOTIVATIONAL SPEAKERS AND ARE TAKING ALL THEIR FANS TO HELL WITH THEM .. THEY CARE NOTHING FOR YOUR SOUL ONLY YOUR PURSE STRINGS SO THEY MIGHT CONTINUE THE POSH LIFE ON YOUR DIME! GO AND RESEARCH HER AND MANY LIKE HER…JOEL, KENNETH, HAGIN, DUPLANTIS, T D JAKE, CROUCH, WHITE, ETC…THEY ARE EVERYWHERE AND YOU ARE PROMOTING IT ! BE A BAREAN … IF YOU FOLLOW ANY OF THE ABOVE DEVILS OF DOCTRINE, I WOULD FEARFULLY REEXAMINE MY FAITH … THESE DEVILS ARE BELIEVING IN A FALSE GOD … THEIR GOD’S … ARE NOT MY GOD … BURN THIS BOOK BATTLEFIELD OF THE MIND AND CRACK OPEN THE WORD OF GOD … THE ONLY BOOK YOU WILL EVER NEED ! I am very well of stances on the issues above, and while I don’t agree with everything she teaches I strongly believe she is a women with a heart for God who is leading others closer to Christ. I have yet to meet a person I agree with on every biblical issue. God gave me the gift of discernment so I know what is truth. You and people like you should focus more on defending your beliefs as you understand them and less on attacking a person personally with whom you disagree.. I don’t think this is the manner in which Jesus would prove his point. As for her taking me and her fans to Hell, maybe you should reread your Bible as it clearly states that I am saved by his grace. Be blessed and BE A BLESSING!